(AP) BEIRUT - Government troops fought back rebels near the airport of battle-scarred Aleppo, Syria's state media said Friday, in the first official acknowledgement combat had neared a strategic gateway to the country's largest city. As fighting raged in both Aleppo and the Syrian capital Damascus, the United Nations announced that Lakhdar Brahimi, a former Algerian foreign minister and veteran U.N. diplomat, would serve as the world body's new peace envoy, aiming to resume efforts for a diplomatic solution to what has become an intractable civil war. Panetta: Syria no-fly zone "not on the front burner"
Brahimi, who previously served as envoy to Iraq and Afghanistan, replaces former U.N. Secretary-General Kofi Annan, who announced he would leave the post by the end of this month after failing to bring about a cease-fire despite months of negotiations. The announcement came just as U.N. observers in Syria were beginning to pack their things on Friday in preparation to close down their mission. Deployment of the observers was one of the only steps taken under Annan's peace plan. The team was intended to watch over a cease-fire that never took hold, and so was left trying to chronicle some of the more egregious instances of bloodshed. Both sides have "chosen the path of war," said the U.N.'s assistant secretary-general for peacekeeping, Edmond Mulet. The U.N. plans to keep a small liaison office to support any future peace efforts. The 17-month-old conflict between President Bashar Assad's regime and rebels trying to bring him down has left some 20,000 people dead, according to estimates by anti-Assad activists. The escalating fight has in the past two months turned to battles in the country's two main cities, Damascus and Aleppo  once firm bastions of Assad's rule. Rebels have managed to keep fighting in both cities despite facing overwhelming regime firepower. 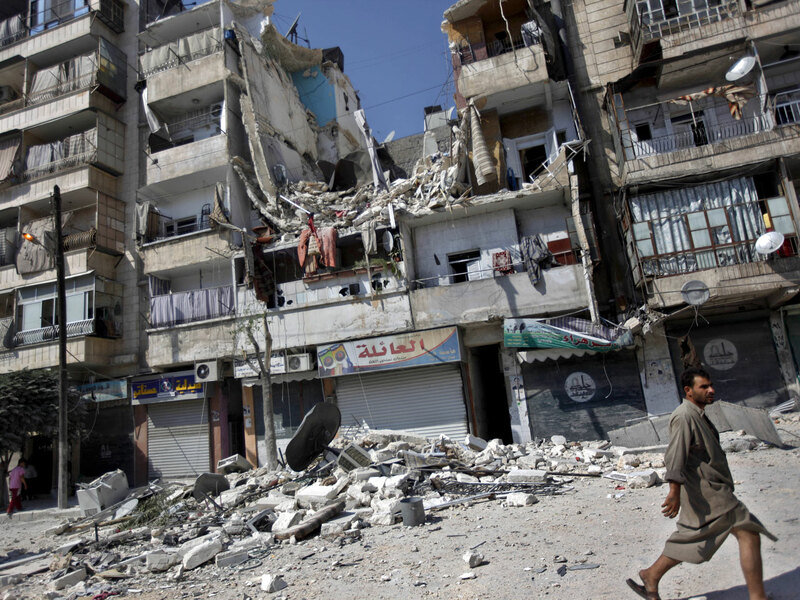 In Damascus, activists reported heavy shelling and clashes in many areas Friday, including western districts believed to have rebel pockets. Damascus-based activist Moaz al-Shami described the shelling as "nonstop" and said gunners were firing from the Qassioun mountains overlooking the city. Regime forces have been fighting for nearly a month to crush the rebels' footholds in Aleppo, in the north of the country. Rebels have been driven from some areas, but the report of clashes near the airport suggests the battles could be shifting to new fronts. Syria's official SANA news agency said "armed terrorist groups" - the regime's phrase for rebels - had been pushed out from areas on both sides of the airport, which is located about 15 kilometers (nine miles) southeast of Aleppo's historical center. The report did not make it clear whether the fighting was closer to the international airport or the adjacent military airfield, a base for carrying out airstrikes on rebel sites in the north. Aleppo carries major symbolic and strategic value. It's the commercial hub of northern Syria and close to rebel-held territory and critical supply corridors to the Turkish border. Rebels have sought control of the ancient center, dominated by a medieval castle that is part of the city's UNESCO World Heritage Site. That would deal an embarrassing blow to the regime's claim that its overwhelming firepower can halt opposition advances. "Those who think that the Syrian Arab army will be defeated are dreaming," said Syria's Foreign Minister Walid Moallem in a state TV interview late Thursday. The U.N. refugee agency spokesman Adrian Edwards said 3,500 people crossed into Turkey on Tuesday and Wednesday. Edwards told reporters in Geneva there are now almost 65,000 Syrians in nine refugee camps in Turkey, about 40 percent of them new arrivals this month. In Jordan, nearly 2,700 Syrians have entered since Tuesday, swelling the numbers there to over 150,000. Beyond the refugees who have fled to neighboring countries, the U.N.'s humanitarian chief Valerie Amos estimated that as many as 2.5 million people inside Syria need relief assistance. The core of Assad's military and political power appears to remain in place, but major cracks have emerged in the wider reaches of his regime. They include high-level military and political defections and the ability of rebel guerrillas to stage bombings and abductions in the heart of the capital, Damascus. French Foreign Minister Laurent Fabius, who visited Syria's neighbors Jordan and Lebanon this week, told France's Europe-1 radio Friday that he was told "there will be new defections on a large scale." He gave no other details. Fabius also defended France's refusal to send weapons to the Syrian rebels, despite their appeals for military help. He claimed rebel backers Qatar, Saudi Arabia and others are sending arms to the rebels  although there has been no evidence of sharply enhanced military firepower by the anti-Assad forces. In Lebanon, tensions from Syria have spilled over into the volatile patchwork of factions backing the rebels and others firmly behind Assad's regime, such as the Iranian-backed militant and political group Hezbollah. In the most prominent incident yet, a powerful Shiite Muslim clan claims to have taken more than 20 Syrian nationals and a Turk hostage in retaliation for the seizure of a family member by rebels in Syria this week. The clan said Thursday it was calling off "military operations" and would halt abductions for now. Another captive was taken by unknown gunmen. Turkey's Foreign Ministry said a Turkish truck driver, Abdel Basit Erslan, was seized as he was driving in the Beirut suburb of Choueifat. It was unclear who was behind the abduction Thursday night. The U.S. and Turkey issued security warnings for Lebanon. On its website, the U.S. Embassy called on its citizens to take extra security precautions, adding that it had received reports of a higher chance of attacks on U.S. nationals. Kidnapping, it added, was another possible threat. The embassy also announced the suspension of the Fulbright and the English Language Fellow student exchange programs. The Turkish Foreign Ministry also advised its citizens to avoid all non-essential travel to Lebanon and urged Turks already in the country to take safety precautions. Arab Gulf countries, including Saudi Arabia, Qatar and the UAE called this week on their citizens to leave Lebanon immediately.